A plea for a community to heal itself: Peter Kirwan reviews New Perspectives’ staging of a John Harvey crime novel. Darkness, Darkness at the Nottingham Playhouse. Photo: Robert Day. New Perspectives has been touring to audiences around the East Midlands for over forty years, with a strong emphasis on new writing for rural communities and non-traditional theatre audiences. This is the company’s first co-production with Nottingham Playhouse, and fittingly brings together the urban setting of the host theatre and the county-wide concerns that are New Perspectives’ forte by combining the urban procedural of the detective thriller with the barely healed scars formed by the miners’ strikes in the eighties. The production marks the stage debut of Charlie Resnick, protagonist of John Harvey’s long-running series of crime novels, in a one-last-job whodunit adapted by Harvey from his own most recent instalment. Darkness, Darkness begins with the discovery of a body, quickly identified as that of Jenny, a union activist who disappeared in 1984 at the height of the action. Resnick has one foot out of the door and an eye on his retirement party, but hard-headed DI Catherine Njoroge (Simone Saunders) newly transferred to Nottingham and keen to make a name for herself, needs his local connections and memories to make an arrest before the press pick up on the story. The production’s strengths are, surprisingly, in its televisual approach to storytelling. The present-day investigation is intercut with the weeks before Jenny’s disappearance, and the two plots move relentlessly together towards the simultaneous revelation of the killer’s identity to both Jenny and Resnick. The various potential suspects are given plenty of space to establish plausible motives: the tempestuous husband who is warring with Jenny over his choice to cross the picket line; the lover from the union whose trysts with Jenny took place in the same building where she is discovered; the neighbourly constable who secretly supports the strikers but harbours a resentment against women. Ruth Sutcliffe’s beautifully efficient set allows for quick cuts between the different plotlines and investigations, and even incorporates a small box set that serves for living rooms and interrogation rooms, which trundles downstage in an effective live evocation of a camera zoom. The scene changes are covered by projections of archive photographs from the picket lines and x-rays of Jenny’s skull, a reminder of the dead woman at the plot’s centre. Yet while the murder mystery is compelling, the compression of the plot necessitates sacrifices. Some of these are inherent in the writing, particularly the attempts to crowbar in backstory for the detectives. David Fleeshman does a fine job as Charlie Resnick; although the noirish detail is somewhat tacked on (especially his sudden, too-specific ramblings about jazz), the production brilliantly stages a sympathetic ghost, picketer Peter Waites (Chris Donnelly), who both forgives Charlie for his past information-gathering against the strikers and forces him to relive his murky history, adding weight to his new investigation. Catherine is less lucky, saddled with a clunky cliché of a subplot in which a caricature of an over-privileged ex-fiancé turns up out of the blue, immediately begins stalking her, invites himself round for a glass of wine and suddenly shoves a glass into her eye. 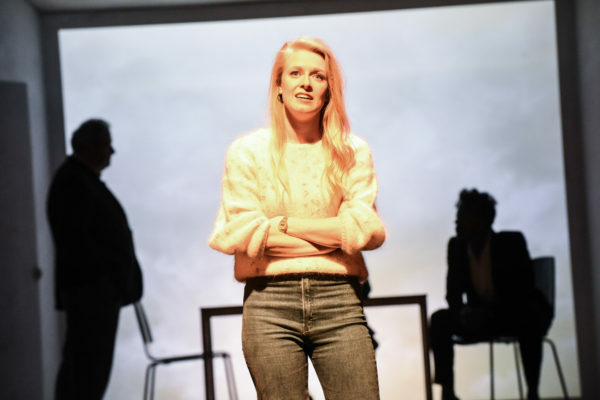 Simone Saunders does her best, but the character is written in two notes: hard-nosed careerist who only knows how to play bad cop, and then bedridden victim. The two detectives at least have a fine chemistry, Catherine’s confident strut balanced against Charlie’s slightly shambolic empathy, and their routine as they interrogate suspects is quietly effective. The other issue the production has is one of pace, with the plot driving scenes through slightly too quickly and not allowing enough moments to resonate. Elizabeth Twells has a difficult job as the dead woman at the play’s centre, but her job is made harder by the production’s over-reliance on dialogue; apart from the occasional held moment at the end of scenes to allow a character to silently react, the cast rattle through the lines and then go their separate ways. When it has the confidence to allow the occasional moment of silence – especially in the powerful moment after the confronted killer leaves the stage and Resnick waits for whatever happens next – the production comes alive, and one hopes that the company will start letting the production’s other emotional punches land. Beyond the immediate plot, though, this is a story of Nottingham’s recent history, and Resnick’s final pleas for a community to heal itself – whether a husband and a wife putting aside their political differences or a miner shaking hands with a copper – give voice to the usually unspoken tensions that a company like New Perspectives is well-positioned to understand and articulate. Despite a few false notes, Harvey and McNamara have created a captivating mystery that also asks serious questions of a community divided by politics and strife. For all that this is part of the Playhouse’s ‘Sweet Vengeance’ season, the play is more interested in whether we can put the past behind us. Darkness, Darkness is on until 15th October 2016 at the Nottingham Playhouse. Click here for more details.